Every working day, DOL is serving Washington residents. The agency licenses and regulates drivers, vehicles and vessels and works with law enforcment to ensure our roadways and the traveling public is safe. But there’s a whole other side of the agency that isn’t as obvious, but is critical to consumer protection in our state. 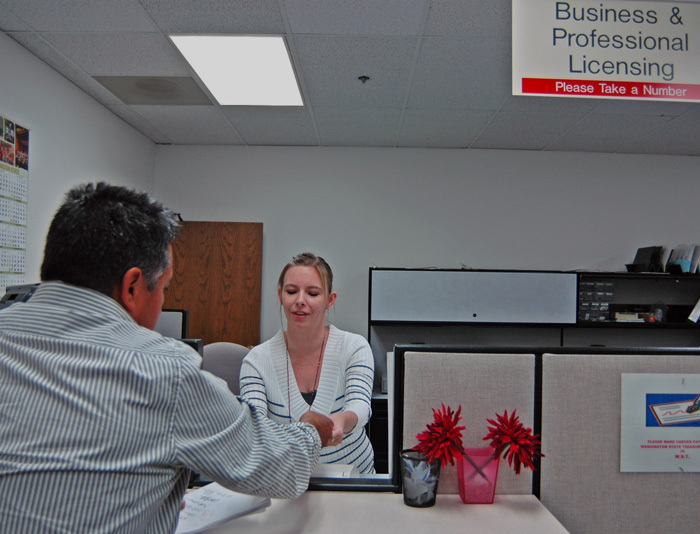 DOL licenses and regulates 30 different professions, and issues business licenses through the Master License Service. Manage about 262,000 professional licenses. Register nearly 4,000 complaints regarding professional licenses. Issue over 3,000 cosmetology operator licenses for cosmetologists, barbers, manicurists, and estheticians. UPDATED – Tuesday, Nov. 23, 3:55 p.m.
OLYMPIA – The state Department of Licensing said that driver licensing offices in Port Townsend and Forks will be closed Wednesday. In addition, all Western Washington driver licensing offices north of Lacey closed at 4 p.m. on Tuesday. DOL suggests people with drive tests scheduled for this week should call ahead or go online to check the status of drive tests at individual offices; many locations are not conducting the tests. Phone numbers and additional office status information is available at dol.wa.gov. All DOL offices will close for the Thanksgiving holiday. More information on that, here. Department of Licensing driver licensing offices will be closed on November 25 and 26 for the Thanksgiving holiday. Offices normally open on Saturdays will reopen on November 27, but will be closed as usual on Monday, Nov. 29. Offices normally open Monday through Friday will reopen on Nov. 29. You can check the hours of operation, and in many cases the current office wait times, on the Office Locations page on the DOL Internet website. DOL officials expect driver licensing offices to be very busy in the days following this two-day closure, making this a great time to try one of the many online driver license service options available online at the DOL website. If you need to renew your driver license or ID card, or get a copy of your driving record, you can skip the trip to a driver licensing office and do it online. Most fall-asleep crashes involve drivers aged 25 years and younger, a sobering statistic that prompted the National Sleep Foundation to take action and launch Drowsy Driving Prevention Week, a public awareness and advocacy campaign designed to teach young drivers and everyone on the road about the dangers of drowsy driving and how to prevent a fall-asleep crash. The Department of Licensing is updating its proof of residence policy in an effort aimed at reducing the numbers of individuals that fraudulently receive a Washington driver license. State law requires individuals to have a valid Washington residence address to obtain a Washington driver license or ID card. The agency will require proof of a Washington residence address if an applicant does not provide a verified Social Security number at a driver licensing office. The documents provided will be copied and later verified by agency staff to ensure that they are valid. After that validation, a permanent license will be issued. The change is effective Monday, Nov. 8. “This is another in a series of steps we’ve taken to clamp down on license fraud and ensure that people are Washington residents if they’re getting a license,” said DOL director Liz Luce. A full list of document requirements to prove residence address is available at the agency’s website. They include: rental or lease agreements, bank-issued documents showing residence address and name or specific auto insurance policy information. Last month, the agency implemented expanded use of facial recognition technology, developed with the Enhanced Driver License program, to safeguard regular driver licenses and ID cards. Design changes have also been made to the driver license — by shifting the picture to the left side, placing an identical but smaller, shaded photo on the right and adding other security measures, licenses and ID cards will be more difficult to fake. Anxious about that upcoming driving test? Wish you could see what to expect? Well, now you can. A new video series featuring Washington’s driving test is now available on YouTube. Each segment in the series runs less than 3-minutes. And while these videos don’t cover the entire driving test, they do address areas that often present the biggest challenges to new drivers. The videos are produced by Department of Licensing staff and feature on-camera performances by DOL employees Katherine Knudson and Jay Glenn. Starting November 1, military personnel with specialized truck driver training will have an easier time getting a commercial driver license (CDL) here at home through a new Military Training Certification Process. This new program allows Washington Department of Veterans Affairs (WDVA) to verify an individual CDL applicant has the required minimum commercial motor vehicle driver training requirements provided and documented by a military service, allowing them to get into the workforce faster. WDVA staff will assess the training a military member or veteran received in the military and verify whether it meets the required minimum commercial motor vehicle driver training requirements in Washington State. Once verification is made, a Commercial Drivers Military Training Certificate is provided. Military member and veteran applicants must still take the commercial driver knowledge and skills tests and pay all basic license and commercial drivers license fees in order to be issued a CDL. Veterans have one year following their release from the military to take advantage of this new program. In the past, veterans were required to attend commercial drivers training programs that covered skills they had used for years in the military. Now, the transition from a military job to a civilian one will require one less step due to the work of WDVA, the Department of Licensing, Tacoma-Pierce County Chamber of Commerce, Army Reserve Employer Relations, Washington Trucking Association, Teamsters Union and the Washington Defense Partnership. You are currently browsing the Licensing Express blog archives for November, 2010.